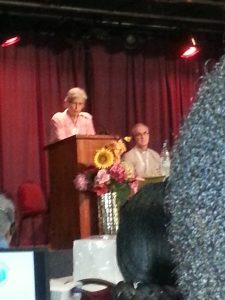 Report given at National AGM by VERONICA CROSS – YOUR WUCWO REPRESENTATIVE. 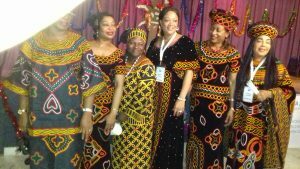 I, AS YOUR VOTING DELEGATE, ALONG WITH FOUR CWL MEMBERS, ALL OF WHOM HAVE CONTRIUBTED TO THIS REPORT, HAVE JUST COME BACK FROM ATTENDING THE GENERAL ASSEMBLY OF THE WORLD UNION OF CATHOLIC WOMENS ORGANIZATIONS WHICH TOOK PLACE IN DAKAR, SENEGAL, WEST AFRICA AND THE MUSIC YOU HEARD WAS OUR INTRODUCTION TO THE MUSIC OF SENEGAL. 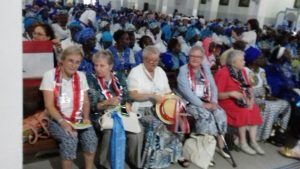 OUR PRESIDENT GENERAL MARIA GIOVANNA RUGGIERI WELCOMED EVERYONE AT THE OPENING CEREMONY AT THE DAKAR GRAND THEATRE, AFTER OUR MAGNIFICENT OPENING MASS AT THE CATHEDRAL OF DAKAR, SAYING WE HAVE GATHERED FROM FAR AND WIDE TO BE HERE, FROM EVERY CONTINENT. 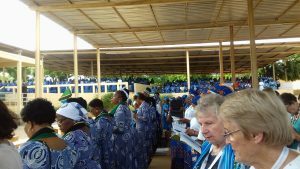 WE HAVE GATHERED TO WORK TOGETHER IN FRIENDSHIP AND LOVE, TO BE CARRIERS OF LIVING WATER TO A WORLD WHICH THIRSTS FOR PEACE WHICH WAS THE THEME OF THIS ASSEMBLY. YES WE HAD A UNFORGETTABLE TIME MEETING OLD FRIENDS AND MAKING NEW, AND OF COURSE THE BEAUTIFUL WEATHER HELPED, BUT WE WERE THERE FOR SERIOUS BUSINESS. BEFORE THIS ASSEMBLY I WAS REQUESTED BY THE WUCWO SECRETARIAT TO GIVE AN ACCOUNT OF THE WORK DONE BY THE CWL REGARDING THE RESOLUTONS PASSED IN FATIMA FOUR YEARS AGO. IF YOU READ THIS REPORT IN THE WOMENS VOICE YOU MAYBE TOTALLY AMAZED AT THE HUGE AMOUNT OF WORK YOU HAVE ALL DONE DURING THESE PAST FOUR YEARS. DECLARATION FOR 2018 -2022 TO TAKE ON BOARD. AS YOU KNOW THE CWL PUT FORWARD A RESOLUTION ON ECOLOGY AND THE ENVIRONMENT ‘A HEALTHY PLANET DEPENDS ON ALL OF US’ WHICH WAS ADOPTED AND AS YOU CAN SEE IS INCORPORATED UNDER THE HEADING ‘EARTH’ IN RESOLUTION 1. A FULL REPRESENTATION OF THESE RESOLUTIONS IS AVAILABLE FROM NATIONAL SECRETARY. BUT I WOULD LIKE TO TOUCH ON OURS FOR A MINUTE: WE ARE AS YOU KNOW ‘DROWNING IN PLASTIC’ A WASTE CRISIS THAT IS FLOODING OUR OCEANS AND LANDFILLS. THE RATIONALE FOR THIS ONE IS THAT WUCWO AND ITS MEMBER ORGANISATIONS WILL PROMOTE THE PROTECTION AND RESPECT OF THE ENVIRONMENT AND THE SUSTAINABLE USE OF NATURAL RESOURCES, IN PARTICULAR DRINKING WATER. WE CWL MEMBERS CAN TAKE THIS ON BOARD NOW, STRAIGHT AWAY CAN’T WE, WITH ENCOURAGEMENT THROUGH EDUCATION AND COOPERATION PROJECTS, THE URGENT REDUCTION AND EVENTUAL ELIMINATON OF THE USE OF NON-RECYCLABLE PLASTIC WASTE. TO ADDRESS THE USE OF DISPOSABLE STRAWS, SHOPPING BAGS, DISPOSABLE NAPPIES, RAZOR BLADES, FACIAL CLEANSING CREAMS WITH PLASTIC PEARLS ETC.ETC. I APPRECIATE WE ARE MOST PROBABLY ALL DOING THIS ANYWAY. I DID ALWAYS USE MY CWL CONTAINER, SETTING A GOOD EXAMPLE, AS ALWAYS!!!! THE GENERAL DYNAMICS PROPOSED FOR OUR WORKSHOPS WERE INTENDED TO PROMOTE: PRAYING, LISTENING, DIALOGUE AND DISCERNMENT – WE FOLLOWED THE METHOD OF ‘SEE’, ‘JUDGE’ AND ‘ACT’. 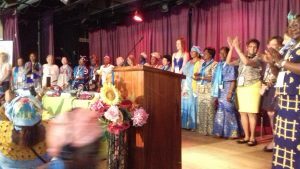 AND TO DISCERN THE ‘ACT’ OF WUCWO WOMEN CARRIERS OF ‘LIVING WATER’ TO A WORLD WHICH THIRSTS FOR PEACE IN THE FUTURE. WE HAD MANY SPEAKERS AND WE SPENT MANY HOURS IN DISCUSSIONS ON PEACE, FAMILY, MIGRATION, PAPAL DOCUMENTS, THE CHALLENGES FOR THE CHURCH AND WHAT PRIORITIES WOULD WE RECOMMEND FOR WUCWO. IN ONE OF THE WORKSHOPS A MEMBER FROM SOUTH AFRICA SAID CORRUPTION OF OFFICIALS, PRIESTS AND POLICE ETC. WAS THE WORSE THING. USA – SUGGESTED WE GET OUT OF OUR COMFORT ZONE. 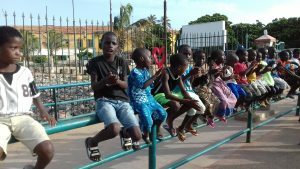 GAMBIA – WE NEED THE BALANCE OF ANIMALS, PLANTS ETC. 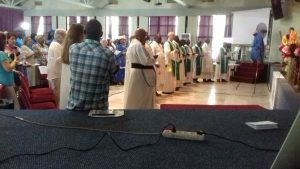 SWAZILAND – CLIMATE CHANGE A BIG CHALLENGE, YOUNG FIND CHURCH BORING AND A LOT OF KILLINGS. 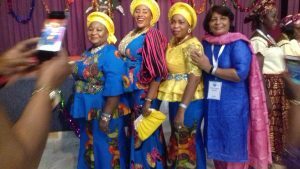 GHANA – WE ARE WOMEN WE STAND FOR THE FAMILY WHICH IS DIFFICULT. IT WOULD APPEAR MORE THAN EVER THIS WORLD THIRSTS FOR PEACE: WE HAVE TOO MANY SIGNS OF VIOLENCE, HATE, ANGER, OPPOSITION, PROVOCATION. 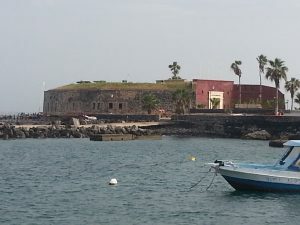 WE MADE A PILGRIMAGE TO GOREE, SENEGAL’S SLAVE ISLAND WHERE MILLONS WERE HELD IN SLAVE CAVES AND WAREHOUSES, FROM 1536 WHERE IT WAS HALTED 321 YEARS LATER, TO BE PASSED THROUGH TO BE TRADED ON TO WORK IN THE PLANTATIONS OF THE NEW WORLD INCLUDING AMERICA. PRETTY HORRIFIC STUFF. WE VISITED THEIR SMALL VERY OLD CHURCH AND SAID A PRAYER FOR US ALL. 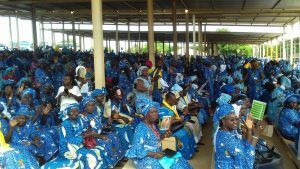 WE WILL BE HAVING A MASS SAID IN DAKAR FOR ALL CWL MEMBERS. MARIA GIOVANNIA RUGGIERI HAS NOW FINISHED HER TWO CONSECUTIVE TERMS OF OFFICE OF 8 YEARS AS OUR PRESIDENT GENERAL. THERE WERE 3 CANDIDATES, ONE FROM THE USA, SPAIN AND ARGENTINA FOR THIS POST AND MARIA LIA ZERVINO FROM ARGENTINA WAS VOTED IN – WE DID ACTUALLY VOTE FOR HER. 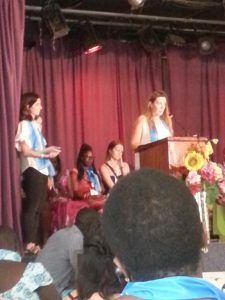 WE ALSO HAVE A NEW WUCWO BOARD CONSISTING OF 24 MEMBERS FROM AROUND THE WORLD, INCLUDING ONE OF OUR ‘YOUNG WOMEN OF WUCWO’ FROM HUNGARY. WE NEED TO REMEMBER THAT WUCWO IS OUR CONDUIT TO THE INTERNATIONAL FORUM WITH OUR OWN INTERNATIONAL REPRESENTATIVES AT UNITED NATIONS, NEW YORK, UNESCO, PARIS, UNITED NATIONS, GENEVA, FAO, ROME AND COUNCIL OF EUROPE STRASBOURG. WE HAD WONDERFUL MASSES EVERY DAY IN FRENCH, SPANISH OR ENGLISH BEFORE THE START OF ASSEMBLY BUSINESS. 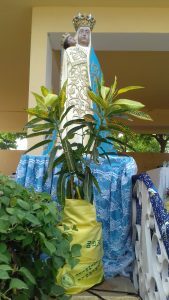 AND OUR LAST MASS WAS AT POPONGINE AT THE SHRINE OF OUR LADY OF LIBERATION AND IT NEEDED TO BE SEEN AND HEARD TO BE BELIEVED. 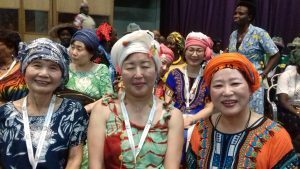 10,000 THOUSAND WOMEN IN NATIONAL DRESSES WERE THERE. THE WORD OF GOD IS DEFINITELY ALIVE IN AFRICA. 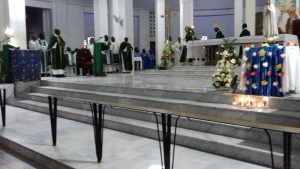 THE CARDINAL OF SENEGAL OFFICIATED WITH 20 PRIESTS. 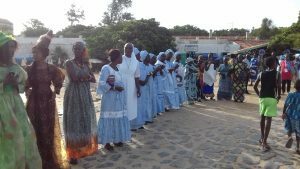 THERE WAS THE MOST UNBELIEVABLE GOSPEL PROCESSION CONSISTING OF DANCING, SWAYING AND SINGING WOMEN, ONE HOLDING THE GOSPEL ON HER BACK. WE WERE THERE FOR 4 HOURS, YES THAT IS FOUR HOURS. THE PRESIDENT WAS THERE AND THERE WERE LOTS OF PRESENTATIONS!!!! 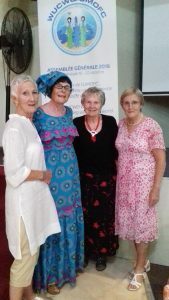 OUR PAST AND PRESENT PRESIDENT GENERALS EACH GAVE A SHORT TALK, AND IT WAS SO GOOD TO SEE OUR ‘YOUNG WOMEN OF WUCWO’ DOING READINGS – WE WERE VERY PROUD OF THEM. 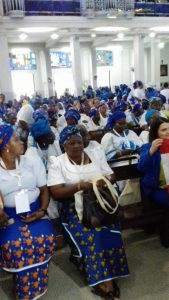 APPROXIMATELY 94% OF SENEGAL’S POPULATION IS MUSLIM, THEREFORE CATHOLICS ARE A SMALL MINORITY, BUT IT WAS WONDERFUL TO HAVE A MUSLIM CHOIR OF YOUNG WOMEN TAKING PART IN THE OCCASION. 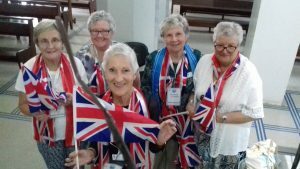 NOW WE COULD GO ON AND ON TELLING YOU ALL ABOUT OUR EXPERIENCES, THE LAUGHS AND THE FRUSTRATIONS, THE JOY AND EXUBERANCE, THE ELATION AND EXHAUSTION YOU WOULDN’T BELIEVE US, WE COULDN’T HAVE MADE THEM UP, BUT DO ASK AFTER IF YOU WISH TO HAVE FURTHER INFORMATION. YOU WILL HAVE TO SIGN A DISCLAIMER, IN BLOOD OF COURSE, BECAUSE AS YOU KNOW ‘WHAT HAPPENS IN SENEGAL STAYS IN SENEGAL’. I WOULD ASK IS THIS US – DO WE FOLLOW THE EXAMPLE OF THE GEESE !! • Programs particularly directed to young people, which can give them reason of family´s worth for the life and the future of the world, as an educator of spirituality and evangelical values. • Campaigns to promote the complementarity between man and woman and to prevent and end discrimination against women and girls as well as any kind of violence and domestic abuse. • Provision of assistance to single mothers and their children, welcoming them to our organizations and advocating for policies to assist them. • Encourage governments to prohibit the practices of alteration, manipulation and treatment of human reproductive material that result in the destruction of human embryos. Such work will be supported with the publication of articles and special sections in WUCWO´s publications and with the launching of a “campaign for the enhancement of the family” through its organizations around the world. e) provide assistance for victims of sexual violence who are often trafficked, and fight the culture of indifference and impunity. • Cultivate and promote a respectful dialogue with the world; with people from other Christian denominations and other religions; within the Catholic Church and among WUCWO´s member organizations and the women belonging to them. • Promote dialogue as a method of evangelization. • Urge governments to promote and guarantee freedom of conscience, religious freedom and tolerance. WUCWO shall promote, through its member organizations, the incorporation of the theme Alcohol and Drug Addiction in its action programs, in order to undertake awareness and prevention-related tasks in all the areas within its purview, paying special attention to children, young people and families. It shall stimulate networking with other institutions of the same and of different faiths, as well as with non-confessional NGOs that share its ethical and spiritual values. b) help families and communities become aware of the destructive effects of corruption, while promoting a culture of truth and honesty. 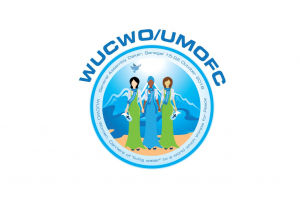 WUCWO member organizations shall ensure amongst its members good practices in the sustainable use of water. They shall, together with WUCWO´s International Representatives, encourage governments to: a) guarantee the right and access to adequate clean drinking water and proper sanitation, b) develop national action plans for sustainable water management based on a participatory approach of the population, through dialogue and workshops and c) Raise awareness among Member Organizations of the growing threat of pharmaceutical products in water systems affecting wildlife and human health.